The realism of John Nava’s paintings stuns the viewer. His mastery of light and shadow is reminiscent of Old Master paintings. Nava’s work invites intimate observation. Often expressive, his life studies have a style and uniqueness all their own. His work is widely collected and proudly displayed in some of the most respected galleries in the United States. Nava received his BA at the College of Creative Studies at the University of Santa Barbara in 1969. He went on to the Villa Schifanoia Graduate School of Fine Art in Florence, Italy and graduated with a MFA in 1973. His work is exhibited in museums and galleries throughout the United States, Europe, and Japan, including the National Museum of American Art in Washington, D.C. and the Museum of Contemporary Art in Los Angeles. 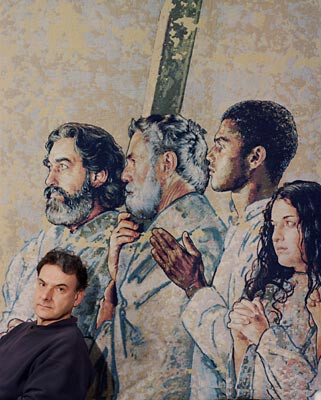 In 1999 the Archdiocese of Los Angeles commissioned the artist to create a series of large-scale tapestries for the Cathedral of Our Lady of the Angels in downtown Los Angeles. John Nava’s documentation took place in 1999 and 2002 and was sponsored by Paula Spellman.